Product categories of Seed & Grain Cleaning / Processing Plant, we are specialized manufacturers from China, Seed Cleaning Plant, Grain Seed Cleaning Plant suppliers/factory, wholesale high-quality products of Grain Procesing Plant R & D and manufacturing, we have the perfect after-sales service and technical support. Look forward to your cooperation! 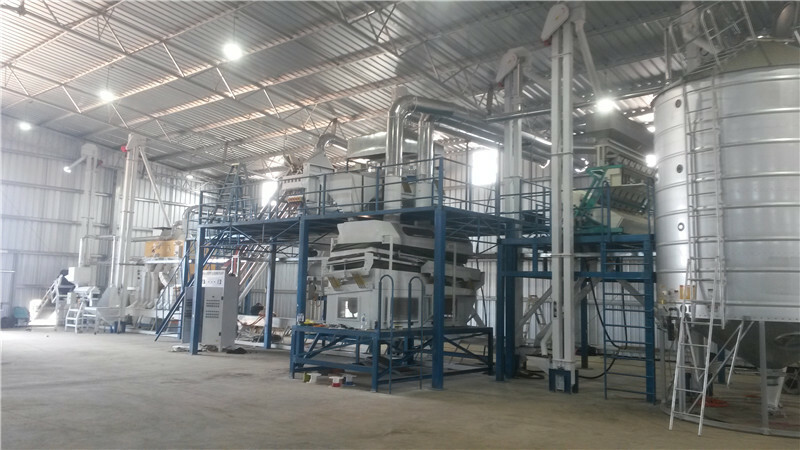 Seed & grain cleaning/ processing plant is a whole set production line made up of different machines. Usually, the seed grain cleaning processing plant includes equipment from seed pre-cleaning, fine cleaning, until seed coating, packing. Grain seed harvested from ground contains much impurity as dust, straw, husk, stems, lumps, stones. To increase grain seeds market value, the farmers/distributors need clean grain seeds before sell. Our Grain Cleaning Plant offers solution to effectively remove above impurity. Farm equipment as seed huller, pre-cleaner, Seed Cleaner & Grader, destoner will do the job. The huller/de-awner removes seeds' surface husk / awn. After then, Seed Cleaner & grader will remove the dust, husk, smashed stems by air suction cleaning. Meanwhile, it will remove the oversize and undersize impurity by sieve grading. After air screen cleaning, the destoner will separate the stones, lumps, glass and Other heavy impurity. To remove the stones and clods, we also have Magnetic Separator, it is used to remove the magnetic clods and other magnetic impurity. After grain being cleaned by above procedures, customers normally add Gravity Separator to remove bad, immature, eaten, sicken seeds. Gravity separator will help to find the healthy seeds. In order to improve the seeds germination rate, seeds coating machine is essential. Seed Treater will coat the chemical, fertilizer film on seeds' surface. The chemical will protect the seeds underground from worm's eaten and prevent diseases. The fertilizer will offer rich nutrition during seeds budding stage. Finally the cleaned grain/ seeds are being weighted and packed into bags. Above is typical grain seed cleaning, processing procedure introduction. For different customers' demands, raw material requirements, we will customize the specific suitable plant design. For example, if clients clean beans, we will recommend extra Bean Polishing Machine to remove soil/dust on bean surface. If client require a high cleaning rate, the color sorter, hands picking belt will be added. We provide customized plant solutions basing on different cleaning situation. Up to now, we have clients over 100 countries, and we built plants over 20 countries. We have engineer oversea on -site installation and training service. Our goal is to make sure the Grain Seed Cleaning Plant run well and client master the operation tips. It is our aim to help clients get satisfied grain seed cleaning effect.